A message she never wished to read. He was tall with brown beautiful eyes, charming enough to make any teenage girl would fall. That day for the very first time she wished to talk with someone she barely knows but, ”why would he talk to me” she thought and walked away. But universe heard what she wanted. The same evening her number was shared with him without her knowledge. 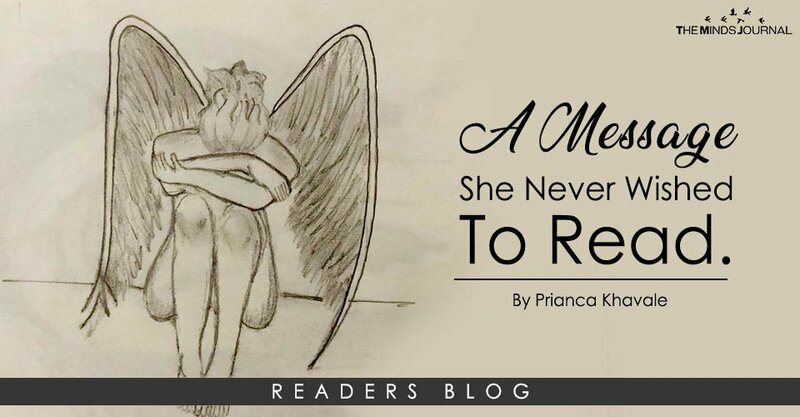 And her first story started One afternoon while returning back from her High School, she received a message; message that she never wanted to read, message that she was always afraid of, next moment she found herself crying in a cab she was travelling, people around her stared, despite knowing she couldn’t stop herself and kept on crying like her loved one just died. It was 9 am when she read ”hey girl, it is been long we didn’t talk Just want to inform you that m getting married soon, my folks want me to settle down. You take care bye” and that’s it. 5 years drown in the sea with just one message. she reached home completely shattered. she was 18 by then, they started when she was 14, Yes she was too young but that’s how it was. the first time he was smiling and the reason was not a new toy anymore, she was worried about her dresses and looks now, her favorite cologne was his fragrance. huge were never this comforting she was drifting away every time they met and that when she decided she doesn’t want this to end never ever But life is tragic as years were passing with him she realized, he is breaking promises which he made looking straight into her eyes, and very soon she was convinced that at some point in her life he would abandon her. still, she held him tight very tight with all her possible strength. she was bearing deep scratches on her soul. she cried for months after that message. Almost lost herself, even stranger passing by could find out that she was not fine. She got pale, it was unbearable every night she choked crying, writing all the possible messages to convince him failed one after another for several nights. there was complete silence on the other side. mother realizedsomething is wrong when she stopped singing her favorite muse and introvert silent dad was now trying to be humorous. but maybe her eyes refused to see anyone around, she was busy starving herself to death. and life knew she is made for something more than this and with time she picked herself up it was not an overnight process. it took away her many bright mornings and peaceful nights She started reading, connecting and analyzing and concluded asking herself is this really worth? and the answer was big No. Soon she went back to studies and that year she made her family proud of the incredible academic result, shifted to a new city and made through her dream college While she was walking towards betterment she thanked herself for that moment when she asked herself is this really worth? While gaining her senses back after this long sickness, she realized it wasn’t him it was always her, her pretty soul made him the man on the earth. it was she who decided to avoid all his mistake and still let him in every time. She still doesn’t know if he was worth but now she surely knows her worth.